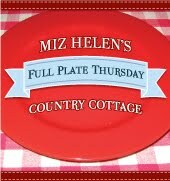 Welcome to Full Plate Thursday, it is so good to see you today. We are in the middle of onion harvest here at the cottage. We have onion's everywhere, they are drying, being wrapped and hung and we are enjoying the great noonday onion crop. We are going to spend our day together out by the garden and who knows you may end up with some fresh onions to take home with you. Thank you so much for coming today and now lets get your fantastic recipe on the table, I'm hungry, lets eat. I try to make comments on all of your post every week and of course we all have our security systems set up around our blogs for good reasons. In the past few weeks I have been having a lot of trouble making comments on the Disqus accounts and spent unbelievable time trying different ways to make the comment until finally this week I finally give up. I have written them about this problem and have had no response. If you have a Disqus account you won't get a comment from me until this issue can be resolved, I am sorry, but sure hope you understand, and if you can help me out with the problem I would sure appreciate it. Thanks for hosting, Miz Helen! Hope you're getting some of this nice rain for your beautiful garden! Have a super week! Thanks for hosting the party. I am going to check out that strawberry stuff. I can't get enough of them lately. Have a great week! Hope the Disqus account issue is resolved soon. I'm not that familiar with it. As always, that you for your party, Miz Helen! Hello, Hope you have had a great week. Thanks for hosting and letting me join in. Thanks so much for featuring my recipe this week, Miz Helen. And thank you for all your hard work in letting us show our wares each week! Hi Helen, I'm a new follower! So happy I found your blog, so many recipes to go through, they all look sooo good. Thanks for hosting! I have had problems leaving messages on Disqus as well and had also finally given up. Thank you for another great party, Miz Helen! Ugh, leaving comments on blogs can be so tricky sometimes! It can be very frustrating. On a sweeter note, I'm sharing my Cherry Vanilla Yogurt this week. Hi Miz Helen! I'm so sorry about the Disqus issue. I got your email and logged on to my account and couldn't figure out why it wasn't letting you comment. I'm going to send an email over and see what I can find out. I truly do appreciate your comments and the time you put into making this party awesome. You are the best! I hope you're having a fabulous week! Thanks for everything! You always have the best things to chose from every week! Thanks for hosting. We linked up a tasty shrimp taco today. Enjoy! Thanks for hosting again this week Miz Helen! I've linked up brownie "graduation hats" today. Onions are my favorite vegetable I wish I could help you out with your harvest. Thanks for the party and I'll see you again next week. Thanks so much for hosting Miz Helen. You're not the only one having problems commenting on blogs that use Disqus. I've also noticed a lot of bloggers who used to be "comment" bloggers are now "no comment" bloggers. Its really hard to comment now without having to go back to the original blog post. Its a tough life, isn't it? LOL Hope you're having a good week! Thank you for hosting Miz Helen. Have a lovely day! I agree with you on that Discus account. I've had the same troubles! Thanks for hosting another great party this week Miz Helen! I know what you mean about the Discus account. Sometimes I have a hard time leaving comments so I just skip those blogs... then I feel bad that they didn't get a comment. Thanks for the party, Miz Helen!! It's been a while since I've linked up and I'm so excited to be back joining in on the delicious fun, sharing my Crockpot Beefy Queso Party Dip!! Hope you're enjoying a terrific week! Thank you so much for the feature, Miz Helen! I just love you and your site!!!! Enjoy the rest of your week! We always enjoy our visits Miz Helen, have a wonderful week! Hi Miz Helen. I'm so jealous of all your onions, I love onions. We just have spring onions right now, which I added to my Super Green Guacamole that I shared this week. I always love Full Plate Thursdays; thanks so much for hosting! Thanks for hosting each week Miz Helen. I just returned from the 4th annual blogger get-together at the lake where we celebrated with a luau. I'm so excited...Thanks sooo much Miz Helen for featuring my recipe, Finger Lickin Good Chicken with Homemade Barbecue Sauce!!! I love sharing each week on your link party. Thanks for hosting this lovely party, Miz Helen!